Garam masala is an Indian spice mixture used in many dishes and often added at the very end of the cooking of a dish. It can be 100% gluten free if made correctly. Like curry powder, garam masala usually seems to be made from a standard list of spices, the amounts of each spice customized according to taste. Interestingly, if you do a Google search for “homemade garam masala” there are only a million hits – that’s twice as many hits as for “homemade ketchup” or “homemade mayonnaise” but not as many hits as for “homemade mustard”. What is going on with that mustard? Are beer drinkers interested in mustard at the season of the Oktoberfest? Back to the topic at hand. We compared recipes for Garam Masala from two authors: Julie Sahni and Madhur Jaffrey. Both have written wonderful cookbooks which are excellent and frequently consulted resources – these authors were instrumental in bringing the world of interesting, largely gluten free, Indian cooking to the North American audience. Garam Masala spices before grinding. 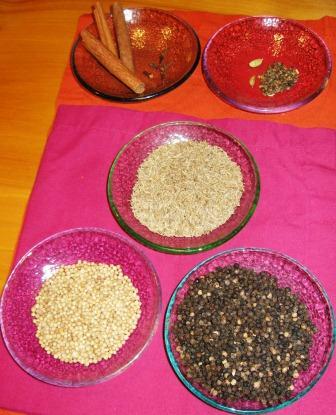 Clockwise from top left: Cinnamon and Cloves, Cardamom, Cumin (in cener), Black Pepper, Coriander. Sahni generally recommends toasting the spices in a dry skillet for 10 minutes, stirring all the while, then cooling and grinding to a powder. Jaffrey’s instructions generally omit the toasting process and go right to the grinding. Jaffrey sometimes omits the coriander and adds nutmeg. By volume, Jaffrey’s recipe from Indian Cooking uses 3 times as much black peppercorn as Sahni’s recipe from Classic Indian Cooking. Other proportions are very similar in both recipes. Why buy stale old spice mixtures ready-made when you can easily make your own pungent gluten free garam masala using whole spices, toasted (or not) and ground up? The Rambling Epicure The Rambling Epicure is a daily international food chronicle, and the first online newspaper to follow global food trends and news.